After installing the final piece to my MasterVolt DC and AC power project I began having issues with battery capacity and engine starting. After a lot of investigation, and the decision to re-cable most of the original (old) and hand made (me) cables, I found the real reason that things were awry. I had added a BlueSea Terminal Fuse Block to every battery when I installed my new Firefly batteries a few months ago. I had used these on my previous boat Jammy, and loved how compact and useful they were, while providing excellent fusing right at the battery terminal. After removing some of the old cabling, and removing the fuse blocks, I wondered if part of my problem might be the blocks. After doing some quick voltage tests, I realized that two of the three batteries appeared to have blown fuses! 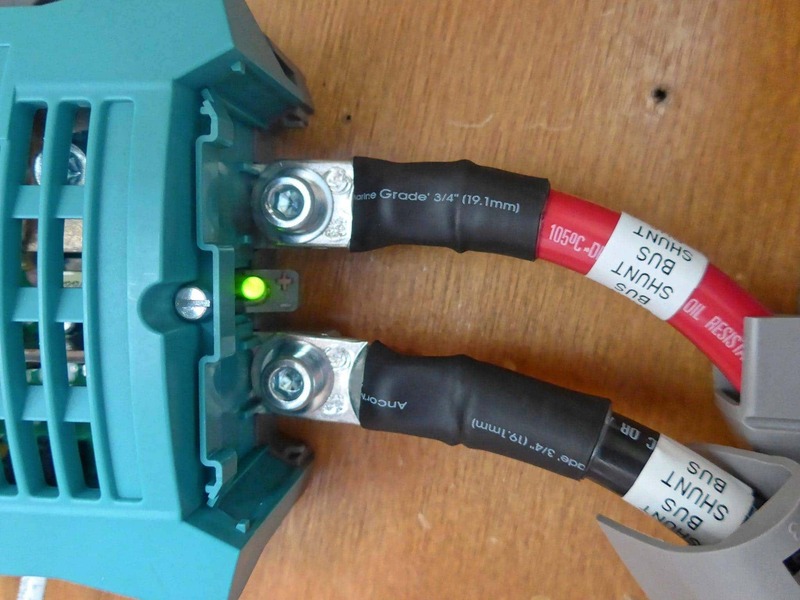 I had oriented the fuse blocks as best as possible for the cable runs from the batteries, not for viewing. 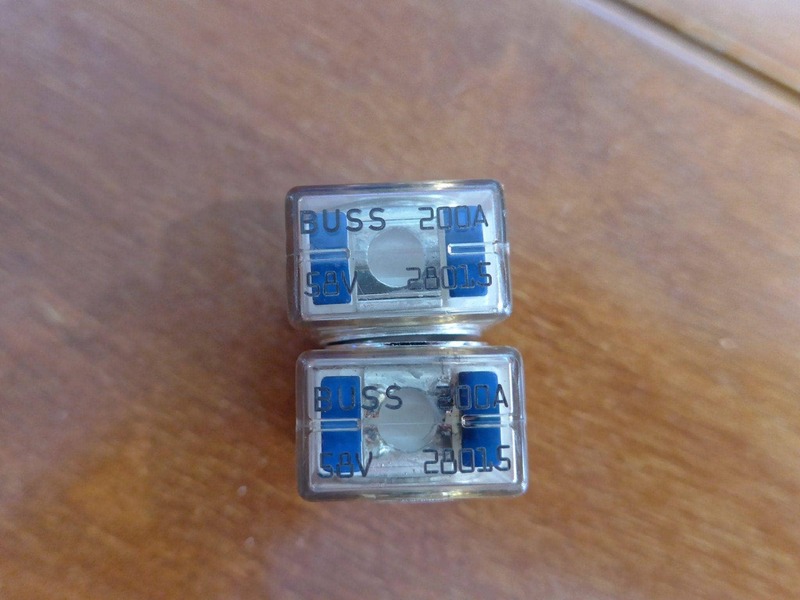 After removing the fuses, I compared one bad one (bottom) to a good one (top). Zooming in you can see that the bottom one has blown – the two smaller sections of the square nearest the center have melted away. 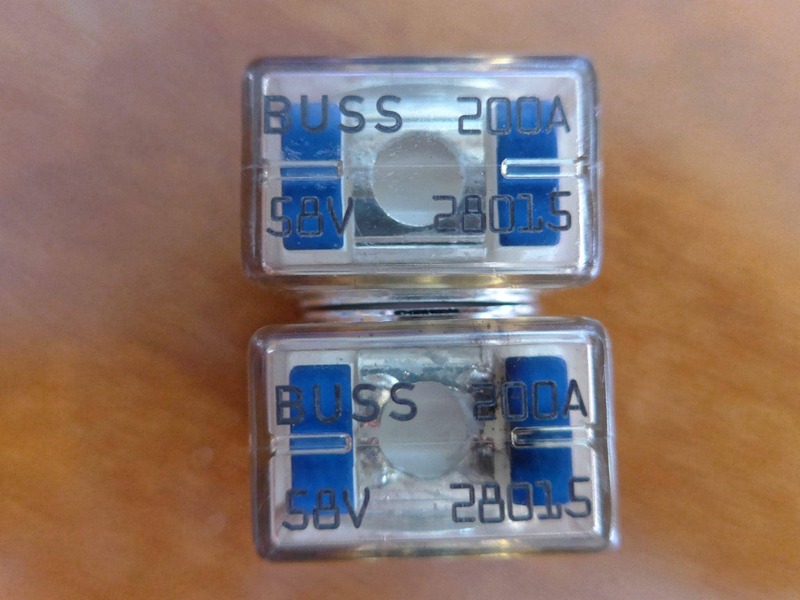 I know how this happened – there are two very close together connection points on the MasterVolt MasterShunt which are connected to the main positive and negative blocks for the boat. While I was reconnecting everything, I did one step out of order, and these were energized when I installed them. The negative lead just barely touched the positive one as I was connecting it, and of course a wonderfully big spark and nasty noise occurred. So the terminal block fuses did what they were supposed to, which is prevent it from hurting the batteries which were “down stream” of this point. The third battery is further away cabling-wise, so I suspect that’s why its fuse didn’t blow, although it could have been a number of reasons. While I am glad they worked, I really wish that there was an easier way to see that one of these have blown. Most people, like me, have these in battery locations which are not necessarily the easiest to get to or see in sometimes. It is also important to point out I’ve been using these for 5+ years and never had one blow, so perhaps it doesn’t happen that often? Glad I found the issue, and that my beautiful Firefly batteries are still happy.